Here's our Quilter of the Month Lisette Leveille with her quilt Graffiti, which was one of her three winning entries in the 2012 McCalls Quilt Design Star competition. Lisette also showed us a few of her other quilts, which demonstrated a family love of quilting. 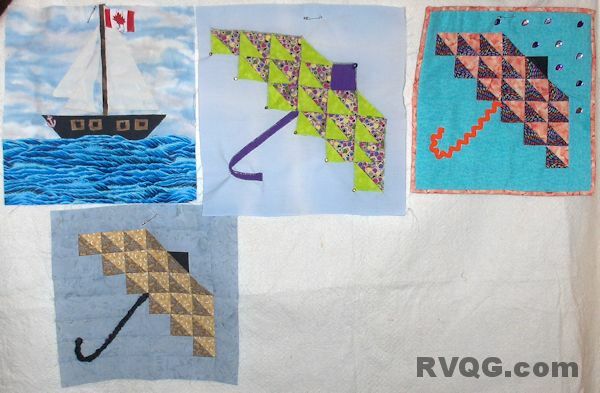 Two quilts included blocks made with her three sisters, and some orphan blocks made by her mother. The sisters participated annually in seasonal row quilts, and round robin quilts. It was very nice to see how quilting has kept the sisters close, even though they now live far apart. Lisette has also volunteered to be our Quilt Show Chair. 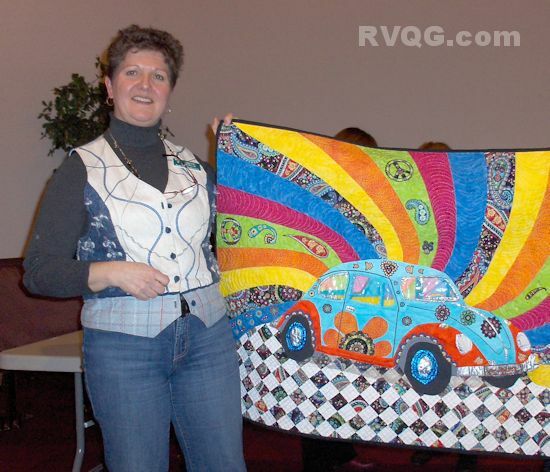 She is looking for volunteers to be on the Quilt Show Committee, so please contact her directly or email us at rvqginfo@gmail.com to learn more or to indicate your interest. The second half of the meeting was buzzing as members hustled downstairs to scout out the deals offered by the ten members who hosted sales tables at our Garage Sale. There were lots of smiling ladies as we all bought or sold a variety of sewing supplies – patterns, notions and, of course, fabric! Thanks to all the participants and those who helped to set up and tear down. You made this event a success! We are down to the second last block in our Calendar Quilt Block of the Month. 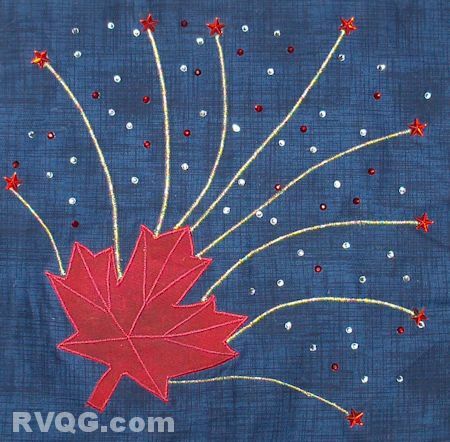 This one celebrates Canada Day, and gives you a chance to be creative with beads, sequins or other embellishments. Members may download the pattern from the Block of the Month page. Our Quilts from the Heart Co-ordinator Carole reported that this month we received 19 quilts and 13 placemats for our charitable programs. Thanks so much to everyone who contributes to these great causes! Not only do they help people in immediate need, but they also spread awareness about quilting in general. There is also still room for Bee Night on March 18. By popular request, Rick McBride will be back to give a seminar on sewing machine maintenance. You do not need to bring your machine for the seminar, however, if your machine needs a tune up, you may bring it along to receive a discounted rate for service. Please contact Bee Night Co-ordinators Janet or Terry for more info, or to sign up. We hope you've all started to think about your entry for the next Presidents' Challenge. The deadline will sneak up on you, so now is the time to get started! In summary, a great time was had by all! I'll leave you with a few BOM blocks that were brought in for display from previous months. See you next time!